Tuesday December 24 1907 I was busy with the work all forenoon. I got my Christmas work about done. I went down town at 1.37 and was down to the court house most of the afternoon. Mr Williams and Miss Place went home. I went up to the hotel with Mrs Brown and walked over home with Ott. I had supper up home and to town with Rob. was at the hotel till the 8.10. Rob started to Minneapolis. Will and I talked till late bed-time about the law suit and tomorrow. 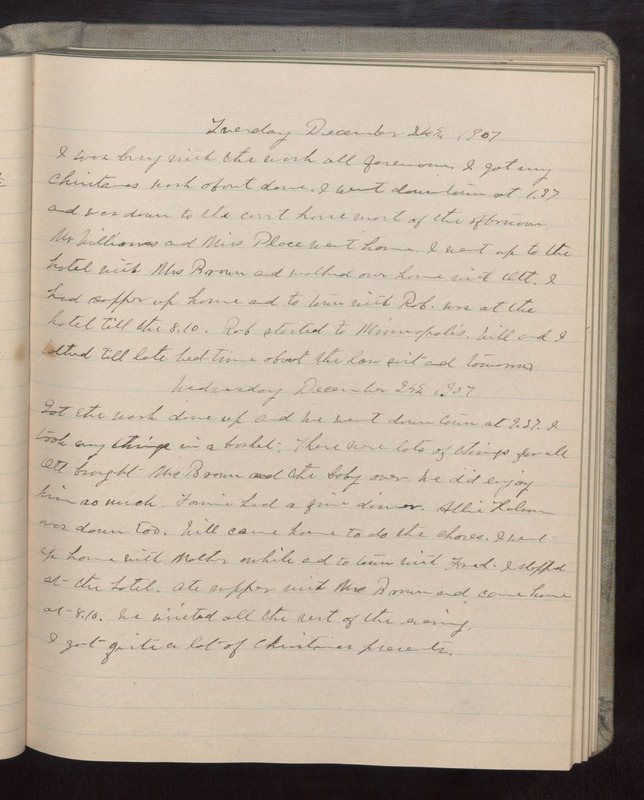 Wednesday December 25 1907 Got the work done up and we went down town at 9.37. I took my things in a basket. There were lots of things for all Ott brought Mrs Brown and the baby over We did enjoy him so much. Will came home to do the chores. I went up home with Mother awhile and to town with Fred. I stopped at the hotel. Ate supper with Mrs Brown and came home at 8.10. We visited all the rest of the evening. I got quite a lot of Christmas presents.